Would you like more information on our work? Are you planning a new project? Or are you just curious? We’re happy to help! Browse through our images, press releases, and facts, or contact us. 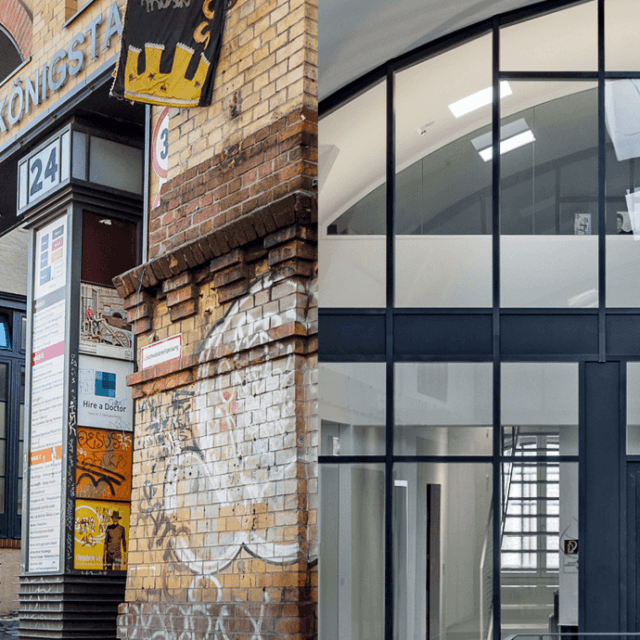 Our offices and workshops are situated in the bustling neighbourhood of Prenzlauer Berg, within an area called Alte Königsstadt (Old Kings’ Town). Our building complex has witnessed a long and turbulent history: In the middle of the 19th century, Bavarian style beer was brewed on site, in 1925, part of the brewery was turned into a Ufa premiere cinema. After housing bomb shelters during World War II, the space was used as a parking garage by the municipal authorities until the fall of the Berlin Wall. Today, nearly 50 shareholders have joined together in this location to form a cooperative and generate and profit from synergies. We have been part of the Genossenschaft Gewerbehof Saarbrücker Straße eG since 2005. Most of the members have a background in the arts or the media. We value the cooperation and are also invested in the ecological, economical, social, and conservational aspects of the setup. We guarantee low rents in the booming city of Berlin and want to play an active part in creating something new. This is where we find space for our research, our experiments and our creative freedom. To begin with, we designed, built, and equipped our facilities ourselves. We offer company tours to see these wonderful premises, so if you would like to get an insight into our work and production, let us know. We’re happy to have you!